Woke up early this morning, feeling the need for something different to do. Every year on this particular day I try and add a new type to my list. I had forgotten how close this day was and my usual source of unusual aircraft was flooded in bookings and work so I figured I would just go up in the Bulldog if the weather was playing ball. A phone call leading on from a cancellation offered up a last minute opportunity. "Wanna go flying, Andy?" said Ian. "Do I need to eat, breathe or sleep? On my way!" And so it was I walked out to the bright yellow Cub. After 4 and a half years I still hadn't flown one despite trying very hard to do so. Getting into the cockpit is an art form in itself. Hysterical laughter almost ensued after my first attempt!! But once you are in it is bright, airy and comfortable. The worrying thing was, pilots either love or hate the Cub. The editor of a certain magazine close to our hearts has taken an awful lot of stick over the last year or two for not loving them. This should at least be interesting. Heel brakes and a 16 knot wind from the side made taxying interesting too, but we were eventually under way down taxiway K, wind behind, me admiring how the view over the nose was far better than I had expected. no weaving required, at least from this pilot, maybe a shorter one may have to a little. Simple power checks complete we lined up. Advancing the throttle halfway (yep, not all the way by any means) I looked at the far end of the runway and pushed the stick forward; feeling her ready to fly almost immediately I eased back and lo and behold we were airborne. Two large guys and a tank of fuel with what can't have been much more than 150m ground roll. OK, we had the wind in our favour, but this was fun! Sitting, as the P1 does, in the front and over the wheels, it is not all that easy to detect swing. Eyes have to be out front and there is no time to check airspeed, you just feel your way into the sky. A small bounce, followed by a kiss of the grass and then I feel the little yellow machine skyward. A few moments of full power at maximum rate of climb give me an idea of what is available if required. To save the engine we settle for 70 and 2400rpm which still gives a respectable 600 - 700' a minute climb rate. The cub that took off behind us was spied over my right shoulder so, now at the dizzy height of 1500' the right wing dipped groundward, then hard left to aim alongside the other stablemate. Underestimating the slowdown when the throttle is pulled back, I have to spend a few moments catching up before we fly echelon starboard for a while, enjoying the sunny morning and the serene view of the Downs below. Breaking off we climbed again to 1500' to get the feel for the stall. Clean stall, a small wing drop, recovered by a small nudge forward of the stick, no power required and 50' height loss. With intermediate flap we fly along at 45 before cutting the power for another stall. Another slow flight practice with the full flaps set (50 degrees!!) before stalling it again with a wing drop and easy recovery. Climbing away, the engine stops (strange that isn't it?!) and I totally mess up the PFL I had forgotten how a high wing floats compared to the lead weight of the Bulldog! The next one was far better, a full sideslip getting us in and under far better control. Climbing back up to 1100' we set course for home and join the circuit for some touch and go's. Unfortunately the circuit was busy with bomber command, so base and the first 2 miles of final was level at 1000'. Then a sideslip, easily controlled, the instruction was no flap unless instructed and I was happy with that. The Cub was certainly easily adjustable in the slip for rate of descent and the adjustment for wind gradient. The only tailwheels I have flown have had long noses, or been flown from the rear and much less view over the nose than this, with the exception of the Taylorcraft and I made the same mistake as I did with the Taylorcraft, ending up having to drag it in. The landing attitude I had noted when we lined up was going to be flatter than I was used to also, but I obviously hadn't paid it enough attention as we landed tailwheel first with the associated small bounce as the mains touched down. I let it slow to a stop before adding power and again I was taken aback at just how quickly this leaves the ground! A couple more circuits with the landings improving to reasonably OK and it was time to stop the fun and get ourselves back to terra firma. There is a huge amount of praise heaped onto the Cub. 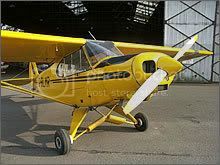 OK, so this was the Super Cub and doubtless the baby brother flies a little differently, but it is basically the same I would imagine. Sweet handling or like stirring porridge? In My Opinion!!! Depends what you compare it to. Compare it to the Bulldog and it can't even compete, except on low speed handling. The ailerons are not quick, but they are not as slow as I had been led to believe they would be. If you include low speed behaviour then the Cub does start to gain feathers in it's cap. It is also reasonably sensitive in pitch. I would certainly not hesitate to do wingovers in it. I would not even bother with a PA28 for example. So it does give plenty of feedback. I would be happy touring in it, so long as there was no rush. It is certainly more comfortable than your average 152, though the tandem seating does cut down on socialising. The view out of the front in straight and level flight is simply fantastic, so much so, that I kept climbing as I was expecting the nose attitude to be somewhat higher against the horizon. It talks to you. You immediately know when you haven't pulled the stick back far enough in a steep turn and it can be flown purely on the view outside with no need for a quick instrument check to back up what the seat of your pants is telling you. Would I fly one again? Yes, most certainly. My feeling is that it does have a huge rosy glow around it in a lot of peoples eyes. Cub officianado's swear it is the best handling sweetest aeroplane there is, but I am not sure the romanticism of that is true. However, it does handle well at slow bimbling speeds, the view out is still good at slow speed, it takes off and lands in a very short distance and is a great FUN aeroplane. I would certainly have one in my dream hangar, but maybe not for the reasons that some would. It is an aeroplane to my mind, that you would jump in for its sheer simplicity of operation, its good manners and its short field grin factor. The way things work are strange. I got a phone call a few hours later to tell me that the guy I have been pestering for months for a Cub flight, who was too busy to fit me in, had to cancel a flight in a Stampe due to the rather sporting wind and would I like to go flying? No, I didn't got to go out, not enough time, so I had to say no!! For anyone thinking about what the challenge of an Aero's competition would hold and feeling rather unsure or out of their depth, this is a marvellous way of learning the ropes from the experienced guys. Nick and Jen Buckenham go out of their way to make you feel welcome and advice from a variety of sources is never far away. We had initially booked in for the event in the Bulldog, but owing to maintenance over running, had to change to the Extra to enable us to still fly. The Extra is one awesome aeroplane. Every time I am lucky enough to squeeze into the cockpit of one I am amazed by the raw power and ability of this airframe. With a little more experience under my feet since the last time I flew one, I was happy to be able to take a little more advantage of its abilities. Flicking out of a stalled turn is great fun as you are secure in the knowledge that relaxing the back pressure will get you flying again. A flick out of a botched quarter clover, some interesting variations on exits from stall turns and a new way of keeping the pull up on a loop straight were the main memories from the practice session. A quick run through of them sequence and then we were heading for the 'box'. Hmmmm....this box thing. It's not very large. A cube with 1000m sides in an aeroplane that was doing 140 knots. You don't stay in it very long at all!! That is probably the most daunting mountain to climb in this entire competition thing. Oh well, let's go for it anyway. Trimmed out, 140 knots, 3 wing rocks to notify the judges that we were about to commence and immediately I was off axis. Those wing rocks need some practice. Pulling up into the first 5/8 of a loop the nerves went as concentration kicked in. We were almost vertically down before I started the roll so it was hurried and against the burble of the stall. I was aware that I had come out off line, but unsure how much. Straight and level briefly before pulling up again for the half cuban, over the top, nail the 45 degree line, hold, then roll, spinning the world around the nose.........damn, where the hell am I? Where did the runway go? Oh bugger! Prompted from the rear seat I rocked the wings three times and we climbed and turned, found the runway again and set ourselves up for the rest of the sequence. You can do this in beginners competitions with no penalty. The idea is safety related, why push on becoming more and more bewildered and losing concentration when you can break off, gain a bit of height and start from where you broke off. You are also able to employ this if you are getting a little low. 1500' is the absolute limit for the Beginners sequence and it is strictly enforced. Back to the sequence and the stall turn is actually ok, before pulling the nose away from the ground to enter the loop and the final roll. Rolling an Extra with its 400 degrees a second roll rate, means that stopping wings level requires a fair amount of concentration. Three wing rocks signals the end of the sequence and we join crosswind to land. Some time later....these aerobatic competitions are clearly places where you drink lots of tea, talk lots and get to increase your heartbeat enormously for a few frantic minutes in the day.......the judged sequence started. The nerves on climb out were enormous, I hoped I would be a little more aware of my surroundings this time and wouldn't go to jelly. "G-DUKK entering the box", three wing rocks, get closer to the runway this time, glance at airspeed, runway almost on the nose, pull up, up into the loop, down the other side and roll to the left....hey fantastic, I can actually see the runway out of the corner of my eye. Keep it straight and level, count to three, 140 knots and pull into another loop. Over the top, small correction to keep wings level, establish downline and nudge stick forward to keep it straight. Bugger, too shallow, I know I haven't made the 45 degree line, but keep concentration going Andy. Roll upright, runway out to my left, in the right place. Straight and level, position ok, pull up into the stall turn, the Extra keeps on going up for seemingly ever, clawing at the air around it with the prop. As we slow down, feed that right rudder in, the airframe starts to vibrate, kick the left rudder, stick over to the right to counter the adverse yaw, forward a little too to keep the downline vertical, right rudder to stop the nose passing through the vertical and we are pointing at the ground. Wait for the speed to increase and then pull to straight and level again. Eyes to the right, runway still there (oh my word, this works! ), pull up into the loop, a little too gently, float over the top, build up speed on the downward path gradually feeding n more back pressure on the stick and level. It felt good. Very good. I had survived and I had gained a lot of knowledge and had enormous fun. As I wandered upstairs looking at my scores I was more than happy. Quite frankly if I came last the scores were enough to please me. So it was with surprise that I was surrounded by the others asking my score. It was with even more surprise that I realised that my score was the highest at that point except for Ridders who was airborne and two others. Contest Director: Nick Buckenham. Contest Chief Judge: Steve Todd. Scorer: Jen Buckenham. Judges: Steve Todd, Graham Hill, Lynne Westnage, Ed Harding. Judges Assistants: John Vize. As an aside, I also managed some P1 time in RobL's extremely lovely Taylorcraft. Thanks for trusting me enough in the left hand seat Rob. She is a lovely machine and it is good to go and fly something like an Extra and then immediately get into the Taylorcraft. 300hp to 65 hp, extreme machine to gentleman's carriage, 85 knots over the numbers to 40mph over the numbers. Sometimes things in life don?t pan out in the way you expect them to. Sometimes decisions are made that though major, are made under stress or excess emotional circumstances that affect every day of your life. Far more than you ever realise they will, with far reaching consequences that will last until the day you die. Attempts to put right those decisions are often frustrating and futile, but you persevere in the hope that one day the cuts from the thorns will bring the sweet scent of the rose petals to the fore. Rather like that first ray of sunlight that filters through the leaden grey winter sky, the first song of the birds of summer, that refreshing first drop of thundery rain from the humid sky of midsummer, every so often something happens that jerks you back to that vivid reality that is life. Like a wave washing over you, it makes you realise that it has all been worthwhile. It is then you realise that there is more than just you involved. There are others, with feelings that need considering, with different perspectives on the same thing. Others who deserve to be protected from hurt, yet are also bugged by that same quest, the same curiosity, and the same wantonness of completeness in their life. Others, who through no fault of their own are in the situation that they are in; who will be facing equally strong inner struggles, equally disruptive additions to their life, regardless of how good or bad those additions are. These are things that wreak havoc with the grey matter, keep it turning over at a rate of knots, the subconscious working overtime trying to work out the best solution to the situation that presents itself. Ever aware, the pondering continues even when you are asleep. On the one hand your mind sees nothing but a positive outcome, a future of happiness and joy, filled with love and adventure. On the other it sees fear of the unknown, excited nervousness, which leads to feelings of inadequacy, dread of change, even a degree of paranoia. Impatience being a human trait, once the thorns thin out and the rose petals become visible, it is so hard not to charge ahead, full steam ahead like a bull in the proverbial china shop. No, caution is needed, indeed is required in order to let those butterflies subside and for common sense and logic to take over. Time for others to think things through; to work out those monumental decisions according to their perspective. Hopefully everyone reaches the same decision. Nothing in life is achieved by playing safe. Striking out down a different path can be very scary, but can also bring renewed vigour and excitement to life. It takes courage, it takes perception and a certain amount of daring, but more often than not it brings far greater rewards than just playing safe. Adds that certain pizzazz to life. Brings new chances, new opportunity, new verve. And a satisfying of the curious within us all as we turn that corner and hit the next straight running. If a certain person reads this, they will know who they are.....I'd like to turn that corner with you. "Game on!" came the call as we tried hard to join in loose formation with a tightly turning Bulldog. The following couple of minutes were a blur of black and yellow, red and white; twisting, turning, wings on the edge of their aerodynamic limits, one pointing to the beautiful angels in the bright blue sky, the other to the white sheep in the lush green fields below. Stall warner breaker pulled, the buffet kicked and punched the wings as it tried so hard to relinquish the lift from those hard working wings. Momentarily straight and level, a glance to the right and we pulled hard over to the right in an attempt to lose the bumble bee ?dog on our tail. That did the trick, canopy to canopy, each pulling as hard as he dare on that stick, gaining gaining gaining, we are almost on his tail, guns blazing and the imaginary tracer cuts through his tail. Breaking off to regain some height, we pondered on the day so far. One of those days one is glad to be able to fly, blue sky beckoning, visibility superb, cold November air helping performance. A side bet was placed that Ridders had to carry out a stall turn to at least 9/10 standard and then I would buy lunch for him. Much to my horror, his only fault was to not quite hold the vertical, so I scored him 9.5 and agreed to buy lunch. We looped, rolled and stalled turned our way through the skies, almost alone in the vastness that was our playground today. Fluffy soft clouds bubbled up as we played, beckoning us to join them, to dodge in and out of them. Then down we meandered in typical Mad Dog fashion, the radar traces from our flights must provide some amusement for those controllers who watch over us. Rarely a straight line, a different height reading every time; one moment stationary, the next at VNE. Our height regained, it was our turn to call game on, but wait, our opponent is becoming bored, and he?s rolling around the sky. Not to be outdone and with a chant of ?what ever you can do, we can do better? we joined in the rolling, smiling all the way round. Levelling our wings, ?Game On!? went our call and those black and yellow wings bit into the sky once more. We engaged that bumble bee impostor, he was after our blood this time, buffeting madly as we flew through each others wake, tighter and tighter, head craned behind searching that attacker?. ?dakka dakka dakka? came the sound of his guns, our airframe vibrating as his shots found their way home. Breaking off from the combat to regain more height the talk turned to lunch. Our lunch was a hastily arranged meeting. Gerard had posted on Flyer Forum for a willing victim to join him from his base and I suggested we should meet for lunch as the only previous time I had met the chap was over a Martini in the City. As we barrelled down short final into an impressive crosswind, the pressure mounted as Gerard stopped taxying below us to watch our landing, the black and yellow of his machine standing out against the green of the airfield. Down alive and in one piece we savoured our lunch of chilli con carne and nachos as it warmed those cold extremities. Oh the joy of clear winter skies has to be repaid somehow, this time with cold hands and feet. Good excuse for some hot food though! Lunchtime over, brief completed, we marched out to our mighty fine steeds, ready for battle. And ready for battle we were for a third time. ?Game On!? ?Tally Ho? and our wings danced frantically, desperate to disobey the Laws of Physics, our red and white struggling this time to keep that black and yellow beastie off our tail. He fired?.the bullets whizzed past our canopy. I pulled harder in an attempt to out turn that dastardly pilot. Major buffet, stick shaking like a blancmange on steroids on a bumpy cobbled French street, protesting wings screaming at me to ease up a little. Just a little more, just a bit and I can get onto his tail?the wing let go, the physics won, nose forward and off we go, glad it didn?t flip, his bullets hitting home and we reach the base of our playground and I call a break. We climbed back up for one more go, more of the same, a lot more hitting each others wake so I guess we were both in this one to win. As it happened we ran out of height and had to call it a draw before we were playing slalom with the trees. But hey, it had been enormous fun, enjoyed by both sides. Finally managing to get alongside for some photos, we kept station for a couple of minutes and then headed our respective ways home. I managed to get my revenge on Ridders as he had to make a joining call upside down and we soon joined crosswind the right way up (as requested by the Tower!) for a curved final and a reasonable landing, ready for tea and medals. At the end of April I decided it was high time I started to lose some of the weight I had gained (i) since giving up smoking and (ii) since starting a sedentary job which has meant me being rather heavier than i was a decade or so ago. A photo of me in Cherbourg made my mind up and I joined a Fat Club. Official weigh in every week and such like. The first stone was easy. The next half stone was ok. The barrier came about a lb under the 2 stone barrier and I have struggled for 2 months to tip the scales over that increasingly important barrier. Tonight I did it!!! I have now lost 30 lbs since I started and am feeling a little chuffed. Those doubters out there >>>>>>> it CAN be done! OK, so it was only half an hour of flying. The cloud base was 1100', the visibility was 5k and it was damp and gloomy. Not normally the sort of day one would expect to have enormous fun flying. Taking off we were advised of an inbound helichopper approaching from the NW so eyes were peeled as we headed off that way. Flirting with the base of the grey foreboding cloud, we soon arrived overhead our destination. Nobody in, not surprising really, we pulled those lovely red wingtips around in a steep right hand turn before skipping over the ridge and running down the grass strip before pulling the nose skyward and rolling to the left. The instructor friend sat next to me then took control and eased us skyward, explaining the unusual approach pattern as we went... over the ridge, follow the straight hedge with the tin hut at the end. When reaching said tin hut, ease left over the farm ensuring all is settled at 70 knots, full flap...then aim to the left of that row of trees, but to the right of those others, over the hillock using that to slow us to 60 knots and then remove all the power and nose well back, stick in the gut for landing. The hump halfway along looks more like a mountain, but we are slowed by then and the next demo is a take off. It is now clear why this is a one way strip other than in very stiff headwinds. Power checks carried out, we hold the 'Dog on the brakes until she starts slipping on the damp long grass and we release to accelerate rapidly, airspeed increasing, launched by the hump, stick in the belly as she drops almost gracefully back onto the runway before we pull off, nose forward, keep her in ground effect, trees getting larger, then pull up and turn, right hand this time before the words I want to hear are uttered...'you have control'. Left base join this time, head due south, left at the solitary oak tree, through the gap in the trees at the end of the ploughed field and then descend as the ground falls away, turning quite steeply, ground looking very close, but wings straightened in time for the stick back in the belly and a rather good landing, much to my pleasure. ...to find another red wing tipped, roundel adorned aeroplane, game for a play, circling round right above us. Not being of the nature to disappoint we aim for his flanks, he tags on opposite us and we play tag in the sky for a wonderful couple of minutes. He started to gain, we weren't pulling tight enough, so I gave back control and one steep wingover later he shot right on past us. 'Must tell Janie about our game with the Chippy' I thought, as he admitted defeat and circled to watch me land from the tin hut approach. A low pass and a waggle and we were alone yet again. A stretch of the legs and a wander around the patch, it was a lovely place that is sure, a perfect place on a summer day one would imagine and one I would hope to be back at soon. A pheasant clearing taxy along the strip and back saw us perched at the top of the hill, ready for our 4 minute transit flight back to base. I even managed to pull off one of my best landings ever there too, so a wide grin was assured as we stepped out and reminded each other that fun can be had in even seemingly lousy weather. I flew with this particular instructor when I had done 17 hours. He did the recovery from unusual attitudes with me. He moved on to the airlines but has continued to fly (mainly tailwheel/warbird stuff) and instruct and we have, I would like to think, stayed in touch and become friends through our love of flying because it is such damn good wholesome fun. It has taken nearly 4 years and 450 odd hours to fly with him again, but it won't be so long next time.